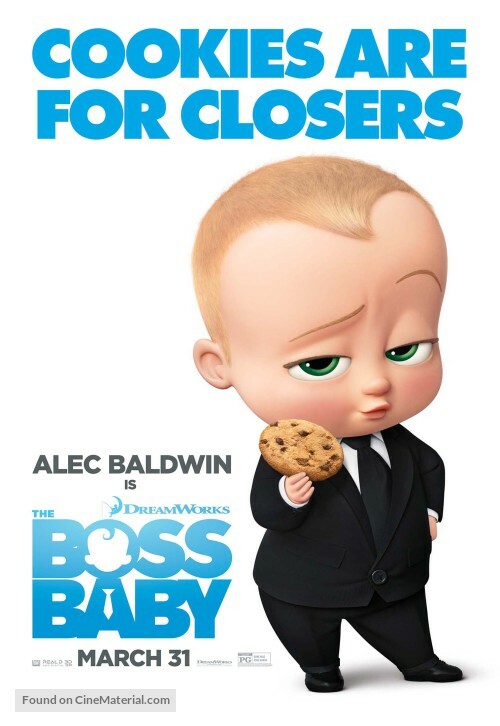 A young boy struggles to deal with the changes in his life when he finds himself with a baby brother who also happens to wear a suit in Tom McGrath’s The Boss Baby. This film is a really bizarre one as it seems to suffer from a fundamental identity crisis. The story itself follows the baby (Alec Baldwin) carrying out his mission to stop a secret plot to have Puppies steal all the love that would normally go to babies. It’s nonsensical but for an animated film it makes a degree of sense that the film could have fun with. Unfortunately the story largely falls apart because it’s unclear if what we’re seeing is real or part of Tim’s (Miles Christopher Bakshi) overactive imagination. Either choice would have been fine but the film fails to commit to one thing or the other which makes the whole experience feel muddled. Immediate comparisons could be made to Rugrats or Family Guy in terms of the style on display but those shows are very clear when reality is being cast aside. My reading of the film is that it’s about a young boy having to deal with the idea of having a baby brother that he never asked for. It’s well established that he enjoys being on his own and doesn’t really want to upset the dynamic he has. The elaborate scheme could easily have been an exaggerated way of him imagining everything it took to get to that point. There are significant hints that this is what is going on but there’s just as much evidence that it’s really happening. The structure of the film seems ready made to exaggerate the events as the whole thing is narrated by an older Tim (Tobey Maguire) who details the events that led to the acceptance of his brother. It could easily be embellished and as far as I’m concerned that’s what is going on here. If that was the intention then it’s an effective metaphor as for young children it would seem like a new baby is taking over so personifying that as Tim’s new baby brother literally being the “boss” of his household having his every demand instantly catered for is a good idea. I found the inconsistencies in the approach to be really jarring. There are scenes clearly set in Tim’s imagination as the animation style changes to make it distinct from the “real world”. There are points where this is abandoned for the imagination as well so it’s unclear what was actually going on at various points. Despite that the film manages to be entertaining some of the time. There are some creative scenes that reference films that the target young audience will never have seen so there are some jokes thrown in there for the adults. I find that the film doesn’t talk down to the audience for the most part which is welcomed and there are some genuinely funny moments in there. There”s the usual assortment of fart and poop jokes to make the kids laugh but that can hardly be held against the film. The animation looks great even if the approach is inconsistent. All of the environments are vibrant and colourful and the character models impressively blend with the backdrops. There are some impressive chase sequences that make good use of the talents of the animators and in general the film is good to look at. Each member of the cast do a really good job. Alec Baldwin’s line delivery is spot on and Miles Christopher Bakshi delivers the youthful enthusiasm necessary. Jimmy Kimmel and Lisa Kudrow do well as the parents and Steve Buscemi as the villain of the story is entertaining off. The material being delivered is fairly by the numbers but the talented cast definitely elevate it. A confusing and inconsistent film that clearly doesn’t know what it wants to be. My reading is that the whole thing is a metaphor for Tim accepting that he has a new baby brother. The baby is personified as management as he becomes the “boss” of the household with his parents catering to his every demand. It’s a clever metaphor but it was unclear if the film was mostly set in Tim’s imagination or if the events as we saw them were really happening. The animation is nice to look at with some impressive sequences and the voice cast definitely elevate the material but there’s a sense that there is a better film in here.